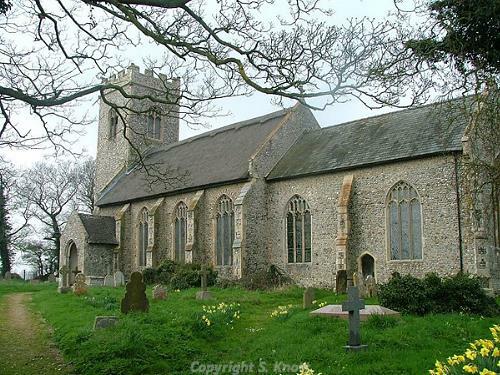 The parish of Swafield contains the villages of Bradfield and Swafield, and is situated just 3.5km from Mundesley, on the North Norfolk coast. The name ‘Swafield’ is though to be derived from the Old English for open land characterized by swathes, ridges of grass or corn lying after harvest. This northeastern section of the parish was extensively field-walked in the late 1980s, and as a result a number of prehistoric implements have been recovered. These include microliths (NHER 23487, NHER 23484, NHER 23482), two Neolithic leaf arrowheads (NHER 23477, NHER 23402), a number of potboilers (NHER 22228) and a possible Neolithic chisel or axehead (NHER 12507). There is also evidence from the Bronze Age period, including an Early Bronze Age flint barbed and tanged arrowhead (NHER 23483), a Bronze Age spear tip (NHER 28862), and a socketed axehead and harness fitting (NHER 39537). There has also been a small concentration of Middle Bronze Age settlement features (NHER 37996) excavated, where Bronze Age and Iron Age pottery sherds have been recovered. An Iron Age Gallo-Belgic stater (NHER 23163) has also been recovered from an area to the north of the village of Swafield, as well as another coin and a bead (NHER 39537) from an area just to the south. A number of objects have been recovered from the Roman period, including pottery sherds (NHER 6845, NHER 38147), coins (NHER 39537) and metal objects such as hairpins (NHER 37276) finger rings (NHER 35973) and brooches (NHER 28749). An area of settlement features (NHER 37996) potentially dating to the Roman period has been excavated, but there are no comparable sites in the Saxon period. A number of Saxon finds have been recovered, of which pottery (NHER 23101, NHER 22229, NHER 23163) is one of the more common objects. However of particular interest are a number of brooches (NHER 6829, NHER 4250) and furniture and dress fittings (NHER 4250, NHER 21435, NHER 23485). Although Swafield is mentioned in the Domesday Book it is assigned only a small value, and it is not until the 13th or 14th centuries that the church of St Nicholas (NHER 6853) is built. However rebuilding of the nave and chancel in the 15th century attests to some wealth during this period. Bradfield is not mentioned in the Domesday Book, however it gained a church by the 14th century, now dedicated to St Giles (NHER 6854). It has a particularly large and fine chancel in the Decorated style, and from the top of the tower no less than twelve other churches can be seen on a clear day. Apart from these two churches there are very few buildings that can be confidently dated to the medieval period, however there is a possible area of deserted settlement (NHER 4250) to the north of the village of Swafield along the Trunch Road. Large numbers of medieval objects have been recovered here, including fragments of a medieval copper alloy dish or bucket. In comparison with other periods, there are far more objects recovered from the medieval period than any other. These include a large number of coins (NHER 29974, NHER 29669, NHER 28978, NHER 23164), as well as many examples of pottery sherds (NHER 38147, NHER 22614, NHER 22229). Other objects of interest include fragments of a medieval cross recovered during ploughing (NHER 6829), as well as a fragment of a copper alloy bowl (NHER 21958) and a thimble (NHER 21957). A similar selection of objects has been recovered from the post medieval period, though these are largely limited to coins (NHER 29669) and metal objects (NHER 37276). A small number of buildings built during the post medieval period have also survived. Of particular interest is Swafield Mill (NHER 6857), a partially demolished water mill that stands in the nearby parish of North Walsham, and whose associated buildings survive in Swafield parish. Also of interest is Swafield Hall and Barn (NHER 22860), a late 16th century building which was altered in the 17th and 19th centuries. Other buildings of architectural interest listed by English Heritage include Swafield House (NHER 47305) and The Beeches (NHER 47306). From more recent history, the northern section of the Norfolk and Suffolk Joint Railway (NHER 13585) also cuts through this parish. It was constructed in the 19th and 20th centuries, though unfortunately the section that linked Swafield to North Walsham has now closed. From even more recent times, World War One has left us with two pillboxes dating between 1916 and 1918. One is situated in Bradfield, at the junction to the south of the village (NHER 32556), and the other is just 40m to the north (NHER 32557) on the edge of the common. Ruth Fillery-Travis (NLA), 1 March 2007.